Reserve 2 tablespoons frosting. Tint remaining frosting with food color to make green; frost cupcakes. 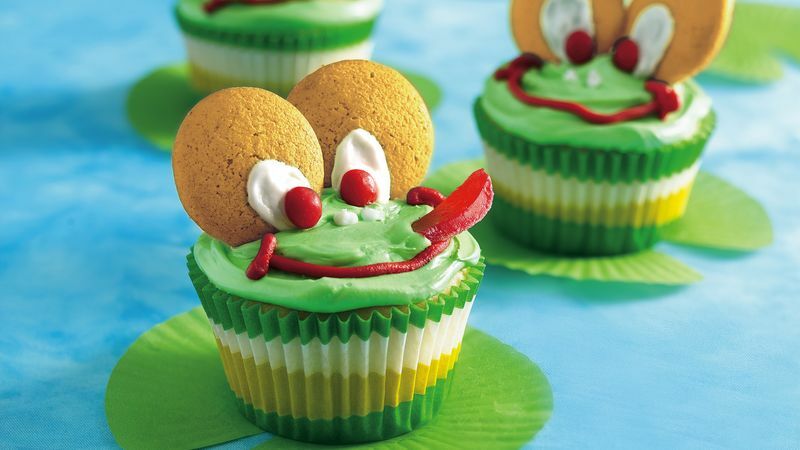 For eyes, place 2 cookies near top edge of each cupcake, inserting on end so they stand up. Attach 1 cinnamon candy to each cookie with reserved white frosting. Add dots of white frosting for nostrils. For mouth, pipe on red icing. Slice gumdrops; add slice to each cupcake for tongue. Store loosely covered. For a touch of whimsy, cut small pieces of black gumdrops and place one on each “tongue” to resemble a fly.